It is always a challenge to attend the Tuesday performance following the Gala event. What they heck am I going to wear? The trick is to forget all about the full length gown and not attempt to top that outfit. Instead, I decided to pull out some vintage. This dress is, without a doubt, my most awesome thrifting score to date. I was performing in Sonora, CA years ago, and decided to go into an antique store to look for a brooch for the opening night party. 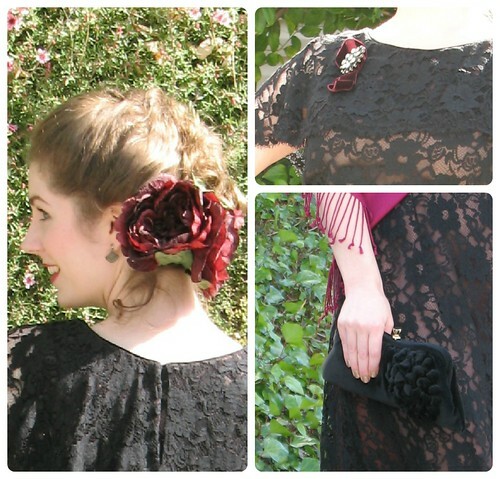 They had this dress hanging on a coat-rack and one other black sheath made of what looked like woven ribbons. I still kick myself for not picking up that second dress, even if I did not think it was going to fit. But I had the good sense to pick this one up! The price was so ridiculously inexpensive it was embarrassing. 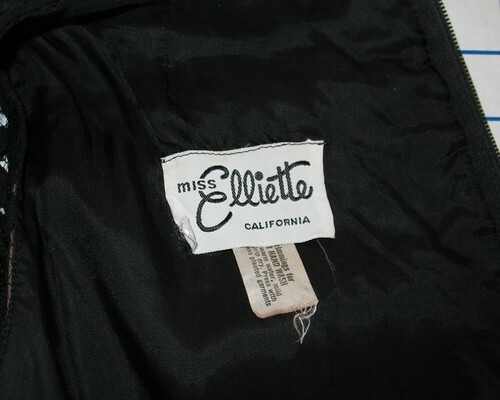 The label indicates that the dress is a Miss Elliette design. From the inside finishing, it is clearly vintage. I assumed late 1950s, but thanks to Vintage Fashion Guild, it seems that it may be 1960s according to the tag design. 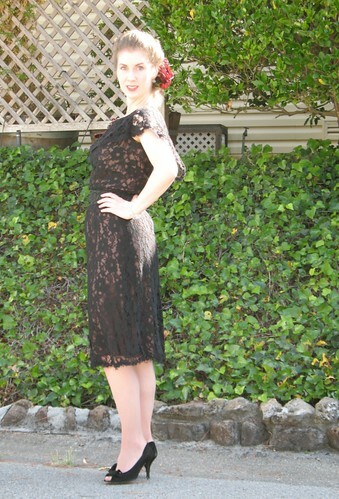 Whatever the year, I love my lace dress. 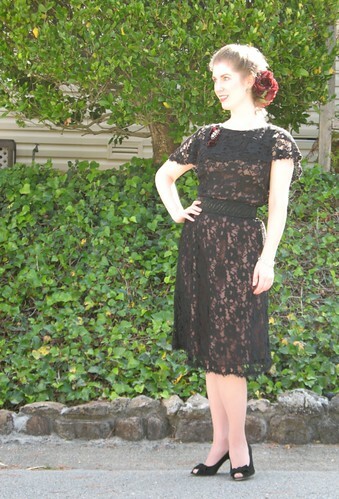 I love lace and lace dresses. This is beautiful and looks like its made for you. Gorgeous! It is definitely a lovely dress! What a win! How elegantly, strikingly beautiful. I'm smitten with your hairstyle and the stunning crimson flowers you adorned it with. Oh this is a wonderful dress! So elegant! And I love the hair flower! That is a beautiful dress-you look great in it too! Beautiful dress, a lucky find. You need to take a pattern from it!